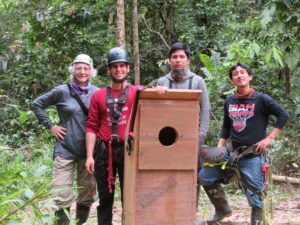 Lisa Dolin, Director of Sales for Special Markets Product Management, Penguin Random House, journeyed to the Amazon Rainforest in Peru to volunteer at the Tambopata Macaw Project last summer. In this “On Sabbatical” feature, Lisa presents bird’s-eye glimpses into her amazing adventure – with stories, photos, and even an audio clip of an actual macaw call. To learn why Lisa describes her sabbatical as “by far one of the greatest experiences of my lifetime,” read on. 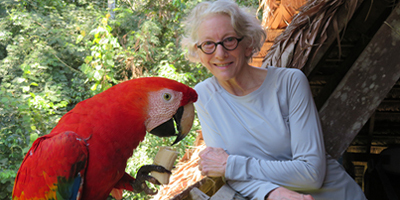 Why did you decide to spend your sabbatical break volunteering for The Macaw Project? I have a keen interest in both birds and birdwatching as well as an alarmist concern for our natural world with regard to threatened populations and shrinking habitats due to climate change, overpopulation, poaching, deforestation, and gold mining in the Amazon. 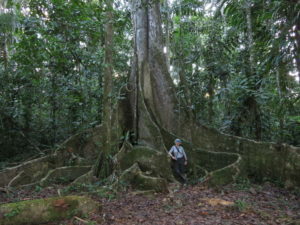 With almost two decades of personal travel devoted to some of the “wilder” places (The Galapagos & Ecuadorian Highlands, Southeast Asia, Borneo/Bali/Komodo, India, Costa Rica, Botswana, and Peru), I’ve come to love the jungle environment most of all. This goes against my own personal comfort, as I have an extremely hard time coping with heat and humidity, and I’m terrified of snakes. Other than that, I’m all in! One year prior to my August 2018 volunteer sabbatical gig at Tambopata Research Center’s (TRC) Macaw Project, I traveled to Peru, as a tourist, with a last stop at TRC as a paying guest. 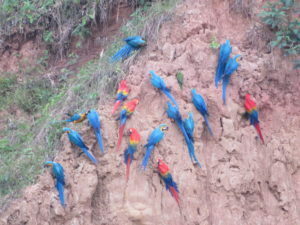 When we trekked to the largest-in-the-world Clay Lick, I saw flocks of big macaws and other parrots and parakeets supplementing their diet with sodium-rich clay. 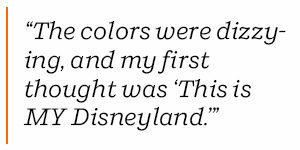 The colors were dizzying, and my first thought was “This is MY Disneyland.” One night while I was at TRC in 2017, several tourists including myself gathered to hear volunteers discuss their work for The Macaw Project, now 30 years running. My traveling companion remarked to me right on the spot, “You have to come back here for your sabbatical as a volunteer!” I was never quite sure whether I went back to TRC as a “dare” or for my own personal ambition. Nonetheless, this was by far one of the greatest experiences of my lifetime. What was involved in the preparation, scheduling and travelling to the Amazon Rainforest? There was lots of preparation for my volunteer work. Although I already had much gear and clothing purchased for prior expeditions, there were necessary additional purchases and lots of list making! After all, I was to spend 5 weeks in a location that is a 5-6-hour boat ride to the nearest outpost of civilization. If I did not pack it, it was unlikely that I’d be able to access what I needed while there. So, I had to pack everything from strong deet, to first aid kits, rubber knee-high boots (worn every day), headlamp, batteries, rain gear, quick-dry towels, energy bars and peanut butter squeeze packs, silica, hydration tabs, medications, etc. This through multiple Amazon.com orders and trips to REI. A few conversations with PRH colleague Kent Anderson (who did one month of bird-watching in Australia and Tasmania for his sabbatical three weeks after mine) helped allay a few out-of-control fears, and he talked me down from my mountain of anxiety. What could possibly go wrong when you are 6 hours away from civilization, have limited solar-powered electricity for only 9 hours per day, and are surrounded by roaming jaguar and puma, caiman, some of the most poisonous snakes in the world (fer-de-lance, coral, bushmaster at 8 feet)? In addition to gearing up, my preparation also included studying the species-specific vocal calls, physical traits, and designated abbreviations for 3 large macaws (Scarlet, Red/Green, and Blue/Yellow), 3 smaller macaws, and at least 10 additional parrots, parrotlets, and parakeets. To hear an actual macaw call, click here. 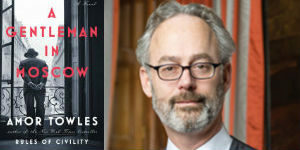 The trips in and out of TRC (from NYC) were 30-hours total. Air travel: NYC to Dallas to Lima to Puerto Maldonado, Peru. From Puerto Maldonado, it is then a 1-hour van drive to the Tambopata River and finally a 5-6 hour boat ride to TRC, located in the Madre de Dios. 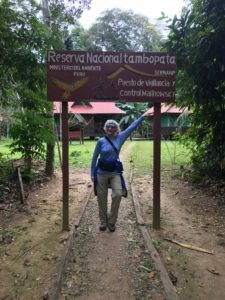 Walk us through some of the highlights of your work at the Tambopata Research Center and surrounding areas. The Tambopata Macaw Project is a long term research project on the ecology and conservation of macaws and parrots in the lowlands of southeastern Peru under the direction of Dr. Donald Brightsmith of the Schubot Exotic Bird Health Center at Texas A&M University. The Project has been working with wildlife and local communities since 1989. A long history of dedicated research and monitoring has provided many insights into various aspects of parrot and wildlife of south eastern Peru. The Macaw Project monitors 40 large (Scarlet and Red/Green) macaw nests. 20 are natural cavity nests and 20 others are artificial (half wood and half PVC), all about 30 meters high. Volunteers carry out psittacine census, transects, data recording at the clay lick, foraging walks, climbing trees (not me). We carried backpacks of 20 kg, walked up to 10 miles per day on trails (always with machetes to clear the overgrowth), recorded and entered data, worked under conditions with rain and/or lots of sun, and were usually surrounded by plenty of insects. Most mornings, the volunteers were up at 4:45 A.M. in order to dress, gather gear (telescope, data collection folders, binoculars, walkie talkies, folding chairs), and walked down to the river dock (1/4 mile away), where a boat and driver were waiting to take us down river to an island where we had a lookout to observe the Colorado Clay Lick. During that quarter-mile walk in the dark, we heard the soft squawks of awakening Scarlet macaws in the trees above and the haunting Howler Monkey calls, watched the sun’s first rays refract on the river’s horizon, saw the foothills of the Andes. These were among my favorite moments of the day. Upon leaving our boat, we walked over an extremely rocky peninsula to the island, where we set up 40 meters from the clay lick to await the very noisy and colorful arrivals. Macaws and parrots (by the hundreds) gathered there each morning en masse from approximately 5:30 A.M. – 7 A.M. The data collection was typically frenzied, requiring many human eyes and lots of skill. 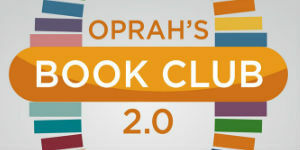 What were some of the most surprising and rewarding aspects of this experience? One very surprising thing that I’d been forewarned about but did not quite believe, were cold fronts that come through the rainforest and jungle during the dry season. The 2-3 times we had these cold fronts, they usually came with amazing downpours and booming thunder. We once had over 18 inches of rain in only 2 days. The temperature was bone chilling, and the kitchen even prepared and served hot chocolate. We walked around wrapped in blankets, and my fingers were frozen. Those were days that we stayed inside, got on laptops, and entered data from the week’s many observation log sheets. Our living quarters were more or less open to the elements. So, during those rainy days, I would also stand at my second floor perch with binoculars and camera and track howler and spider monkeys only 30 or so meters away. Only 10% of the macaw population will have available nests (natural or manmade), so it is somewhat of a “fight to the end” in order to secure a nest and then breed. Because I was not at TRC during the breeding season (October 1 – March 1), it was unlikely that I would see what are called nest fights, but I got lucky and saw and heard one right outside our lodge. Approximately 20 plus Scarlet Macaws were fighting for a specific man-made wooden nest, and the fight continued on for 5-6 hours. The noise was deafening. I understand that some of these fights can actually result in serious injuries. It was fascinating to watch and photograph, and I’d love to go back to witness these on a daily basis. One of the things that was surprising to me was my new-found love for and interest in insects, butterflies/moths, tropical flowers, and fungi. Lucky for me, particularly given my fear, I had only one real snake encounter. It was a magnificent Rainbow Boa Constrictor, and after the initial shock of almost stepping on it and quickly running away, I was just as quickly back with my camera with only a two-feet distance between the snake and me. I had only 3 days off (Wednesdays) during my 4 ½ weeks of work. For one of those days I recovered from heat stroke, and the other two days I rested and joined the tourist-paying guests’ afternoon boat ride in search of jaguar. I never got to see a jaguar, but did see the more elusive and dangerous Puma. Birds that I spotted both on those river excursions and during my work days included: King Vultures, a variety of jacamars, nunbirds, Hoatzins, Anhingas, Razor-billed Curassows, Orinoco Geese, Crimson-Crested and Red-Necked woodpeckers, Rufescent tiger, Cocoi, and Capped herons, White-winged Trumpeters, Trogons, chachalacas, oropendola, Tinamou, Nightjar, Roadside Hawks, Blue-throated piping guans, Black-banded woodcreeper, and pied lapwings. Among the other critters that made me smile were spiders, howler, squirrel, and capuchin monkeys, capybara, white-lipped peccaries, tarantula, agouti, turtles, caiman, beautiful frogs, and airplane grasshoppers. One very pleasant surprise was the company we shared with five macaws in our living quarters. About 25 years ago, The Macaw Project hand-raised 5 or more chicks. Because they were habituated to humans, these so called “Chicos” continue to visit the lodge and the volunteer quarters even though they exist in the wild. It was a privilege to see these beautiful creatures so up-close-and-personal several times a day every day of the week. 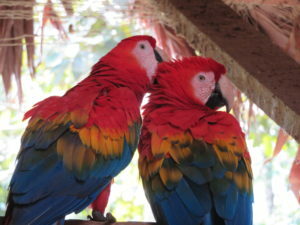 When the Chicos die, there will likely be no more daily visits by macaws into the lodge. Needless to say, I was so grateful for that experience. Luck and the perfect storm set me up for this life-changing experience: my 10-year PRH sabbatical, love of nature, a prior trip to TRC making me aware of the volunteer opportunity. If you decide to take the challenge and volunteer at The Macaw Project, I recommend reading THE LAST FLIGHT OF THE SCARLET MACAW (Random House). Another great book that did not reach me in time, but is an excellent overview of the Amazon Rainforest (spanning almost as much area as the US Continental 48!) is Penguin Young Readers’ WHAT’S UP IN THE AMAZON RAINFOREST.